Lake Okeechobee is back in action producing some of the best bass fishing it has. Many were afraid that the lake would not produce with all the bad press on it but we can assure this will be one of our strongest seasons. A strong bass fishing charter is all you need in order to convince you otherwise. Clewiston is a legendary destination to catch largemouth bass on Lake Okeechobee. Our local experts have spent years acquiring knowledge of how to put you on the best fish possible every time you fish the lake. Captain Mark Shepard is a local legend and if you are looking to catch the biggest bass of your life, he is the one to do it with. Captain Mark had the pleasure of fishing with Justin and Sydney. They were a young couple traveling from Chattanooga, Tennessee looking to get into some Florida bass fishing. Clewiston Bass Fishing was a great option for them especially this time of year. They were greatly impressed with Lake Okeechobee and all that it had to offer. Bass fishing conditions were excellent on this fishing charter. Sydney was not much of a fisherman but loved being out on the water. One of the best parts about fishing on Lake Okeechobee is that wild caught shiners are the most effective method to catching big bass. You can sit back and enjoy while the bait does all the work. It takes some time to dial in on the bite but once they both did, the bass started landing in the boat. Justin and Sydney caught a lot of largemouth bass. They lost a couple in the beginning but big numbers came in afterwards. The largest bass weighed in at 6.75 pounds. You can’t beat that for this time of year. They loved how hard these Lake Okeechobee bass fought. We have super strong fish here on the Big O making for a great day and experience on the water. Bass fishing season is right around the corner. Season looks like it is going to be better than ever. The bass are beginning to get active and already starting to move in. It is going to be a fun season. Captain Mark is looking forward to fishing with Justin and Sydney again next time they visit Florida. Don’t miss out on your fishing adventure next time you are here. 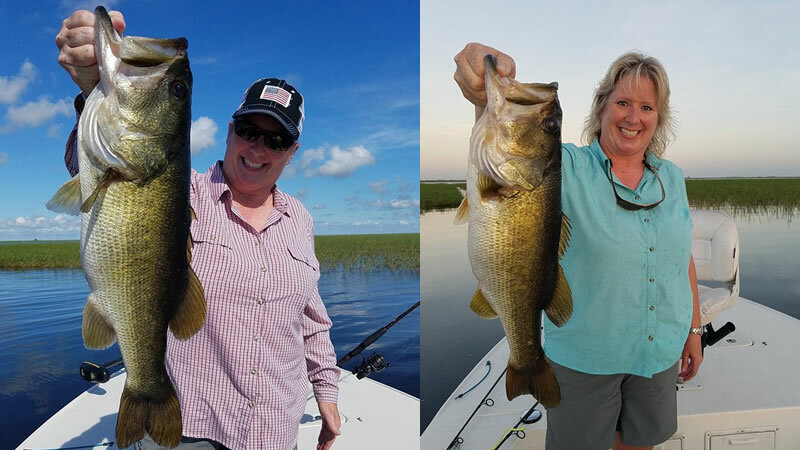 Lake Okeechobee is a great option to catching some of your biggest bass in your life. You will not be disappointed with your decisions to come visit and catch one up. We look forward to seeing you on the water next time!